The Gold Nugget loquat tree produces clusters of small (1-2 inches) in size, round to oval pear shape yellow-orange fruit with about 3 smooth seeds in the center. The skin is smooth and sometimes has a red blush on top of the orangish yellow color. The flesh is sweet and juicy, somewhat like an apricot. A self-fertile tree that produces lots of fruits in the Summer months of late April to June. 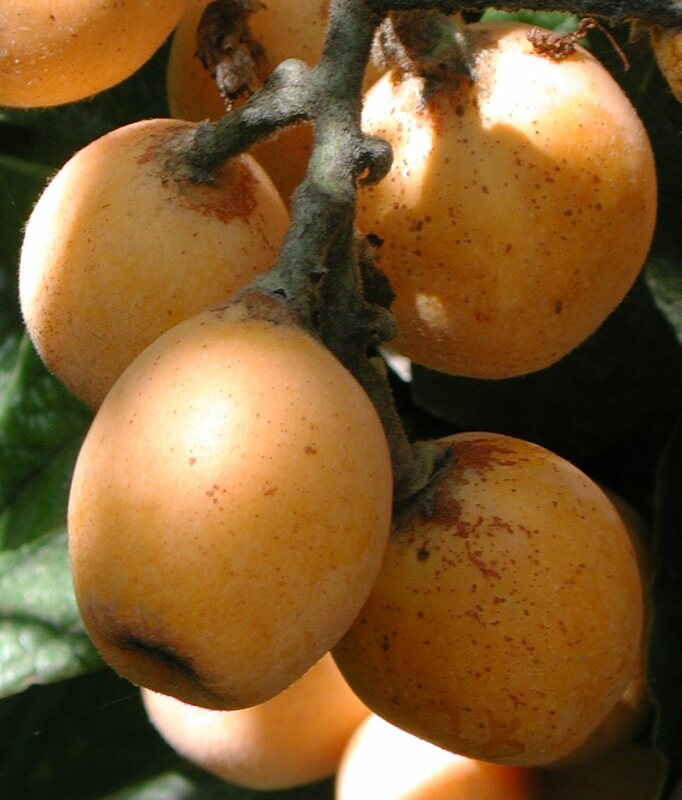 Gold Nugget is the most popular loquat in Los Angeles and Southern California. The Gold Nugget loquat trees are subtropical evergreen fruiting plants with large, glossy dark green leaves that grow well in low light or partial sunlight. The large leaves collect sun from a large surface area. They can become hot in the full sun during heat waves and burn around the tip and edges during the Summer. Mature trees with large and strong roots acclimate to the climate and show little to no stress over time in the Full Sun. They often pop up in people’s backyards from Birds carrying the seeds. Loquat trees are drought tolerant produce clusters of fragrant white flowers in the Fall. Fertilize Loquats with organic fruit tree fertilizer like manure, blood meal, and bone meal. Do not use too much nitrogen fertilizer that promotes growth and reduces flowering. Use organic fertilizers with more phosphorus and potassium such as bone meal to promote fruit production. Few pest tend to bother loquat trees. Sometimes, common insects like the black scale and diseases like fire blight can affect trees. Crown rot is also another known problem. However, in general, trees are resilient and have little issues with pests.